I've mentioned Carolina in this log for several months. Our tracks are ready, and we have dates to track vocals and mix during the first week of November. It feels like it's been forever in the making, but now it's time to go to work. Carolina is from Argentina, so expect a bit of South American flavor. The cool thing about Caro is that she is ready to be 'pushed'. She is not shy at all in asking me to get the best out of her performances. I'll be posting finished mixes before I know it. I'm calling for a haircut right now, so just forget about giving me a bunch of grief about my 'do, ok? While I was in Austin this morning, I made a trip to Carlos Sosa's home studio. Carlos is a total motherf*ker sax player and horn arranger/producer. 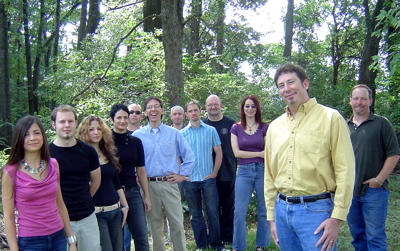 Along with John Pointer, he heads a group called BOOMBOX about whom I've written before on this site. Today, I finally got a chance to sit down with Carlos and hear some of the work that band has done both live and in the studio. Everyone in the band is super talented, and I'm bummed that I don't have all the names in front of me. The tracks are really amazing. With any luck, I'm going to get in on the mixing. The drive back to Htown was superfun as well. I spent WAY too much time on the phone with a new friend in Atlanta, (it was a really good conversation), and I worked on a new song (in my head, of course). Last night I attended a technical demonstration in Austin at the University of Texas. Certain universities and military research centers (sigh) are involved in developing the protocol for the next generation of internet standards. It's called Internet2. The bandwidth and speed is amazing (geek talk alert:): Last night's conference demo took place in two adjacent concert halls. In the first, the Miro string quartet played live. In the adjoining hall, the performance was viewed in real time on 4 high definition video screens and in 10.2 surround sound. You already know what realtime video looks like now on the internet. This was very cool. The sound and imagery was fast and stable. The implications for this tech is all over the place, but imagine your TV and internet service being combined--browsing and watching TV, going to class, downloading new CD's and movies (legally) work, watching the kids, all in realtime with no glitches. I'm sure our culture will find a way to use this and make lots of money off of it. I met some very 'out there' folk last night. A good time was had by all. I stayed with Sarah Sharp and listened to two new songs that really take her songwriting to a new level. I want to record them as soon as possible. There was a string of long meetings yesterday, but fun at the end of the line. I met with Mathew Knowles, and the Project Popstar team at Music World/Sanctuary (finally!). I got my marching so I can get started on the development of the soloists (Tess, Taylor, and Blythe). Blythe has a fan on this site who is already very curious about her nascent career--a star already! Wait till you hear her sing, btw. I will be writing more about that process later, but we will start work officially next week. 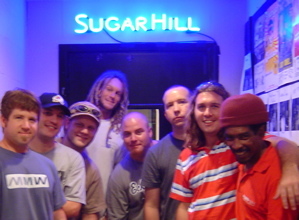 SugarHill Studios is doing a tribute CD, where contemporary artists record some of the many hit songs done at SugarHill throughout the years. It was my pleasure and honor to join Kenny Cordray (gtr), Razz Matthias(vox), Marvin Sparks(drums), and Keith Vivens(bass) on the tracking session for the song, "Hot Smoke and Sassafras" by the 1960's psychadelic rock band, The Bubble Puppy (gotta love a band with a name that stupid--sort of like other psychadelic bands, The Strawberry Alarm Clock, Canned Heat, Moving Sidewalks,..) but I digress.. 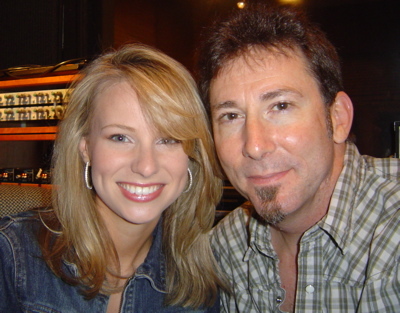 I was producing the song with engineer/partner, Andy Bradley. Andy is the man when it comes to sounds like this, so I strapped on my guitar and joined in on the fun. I don't do many tracking sessions, (I can't keep up! ), but it felt wonderful to blow the dust off my chops and go for it! I think I was pumped that I didn't screw up to bad. I'll be posting a lot more about the Popstar process, and Kim Hull, and Avalon, and the Bama Boys, and Carolina Bedetta, and Winter Roberts, Hollister Fracus, and Kevin Ryan soon. There is a LOT going on in the office right now. I'm off to Austin this afternoon to attend a demonstration of Internet2 at the University of Texas. Pictures and text tomorrow! I've been songwriting lately, and not just on a 'as needed' basis. My long-time friend, Jeff Walton, and I have begun a weekly songwriting effort which is yielding some good results. This is a new one for me. I'm much more comfortable making existing songs sound better. This is working from a blank page. Jeff has scored many, many movies, counless television and film shorts, and has arranged orchestral sessions for some pretty cool bands, (Moses Guest...). More will be revealed, but I think it's going well. I met with Jim from Hollister Fracus last night for about two hours. 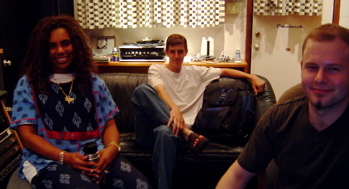 Our agenda was to see if I could help produce vocals for their next release. The meeting went well, and if the business comes together, (it should), we'll start work soon. This will be cool for us because we haven't done any really aggressive metal lately. 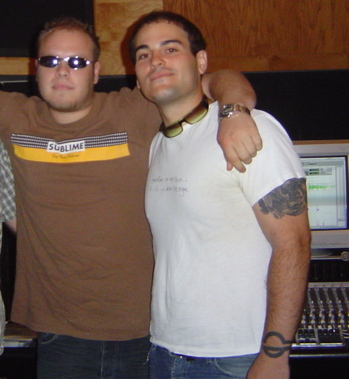 Also, it means that I'll get to work with Brian from Sound Arts Studio here in Houston. Brian's stuff always sounds good, and Sound Arts has a great facility. Actually, this is our (former, sniff, sniff) bookkeeper, Terri's grandson. She brought him by for a visit and he found my stash of kid percussion that I bought for a project last spring. He got DOWN. 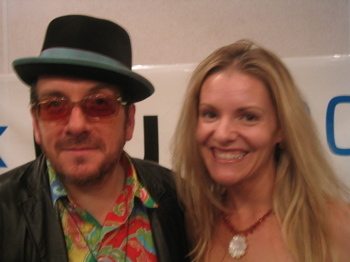 Sarah Sharp was back at Austin City Limits again this week for the taping of Elvis Costello's ACL show. 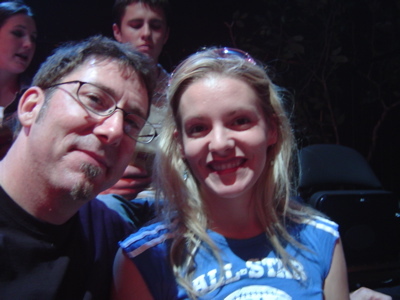 After each performance, producer Terry Lickona does an artist interview and Sarah was there. "Dan, that's cool. But what actually happened was that Jeff McCord and KUT interviewed him in one of the KUT studios for his show "Left of The Dial". It wasn't Terry Likona." I took her to buy a CD (she got the new Taking Back Sunday). When we get home, she asks me to make her a sandwich!!!!!! When I suggested that I detected a distinct lack of gratitude, she went on to tell me how I never do anything for her!!!!!!!! (This behavior has a lot to do why Producermama-Christi bailed to spend the weekend with her Dad & Sis, one hundred miles north of here). In a few minutes, Logan and I are going to see Htown rock heavies, Hollister Fracus. I'm talking to Aerik (manager) and Jim (frontman, singer) about producing vocals on their already stunning tracks. This would be cool because a) they really are amazing, b) Jim is super talented, and c) Manager Aerik has the MOST rock'n'roll name I have ever seen in print!!! I wish I was 'Aerik Workman',... how cool is that? Tonight I get to experience the vibe first hand. On the way out, Logie can tell me all about the Incubus show last night. Meet Tess Ferguson. Tess has a really charismatic personality. She sings a lot like an early Janice Joplin. (she dances just like Janice, too :) ) When I met with Tess, she seemed eager and apprehensive all at the same time. I think that we hit it off supergood, though. This morning I met with Blythe Herring. Blythe is already an accomplished actress. She was intriguing in that she was the most comfortable of the three finalists while at my office. A very pretty lady and a good sport during my photo disasters! I met Danny at the Tape Op conference in New Orleans last May. He is an incredible engineer with quite a resume. Danny had fled the hurricane and traveled to Houston with his wife and cat (good man). Here's Jennifer Grassman! She plays in a band called Eden Nox AND finds time to be the Dan Workman Music Uber-Intern. Jennifer's sound is rock and classical combined (look out Amy Lee). She and I are songwriting together at the moment. I'll be posting some of our work soon. Meet Taylor Crowley. She's one of the three Project Popstar finalists that I will be working with. Taylor can sing, dances well, and is a very interesting young lady to boot. She has traveled extensively, living in Europe, Massachusettes (did I spell that right? ), and now Texas. I'll be writing more about how the Popstar productions progress. My day started on pause as I stood in line at the bank for an hour. Not to worry, though, I was looking forward to a great day at the office, catching up on a lot of critical listening and planning some vocal arrangements. Later on, Christi comes down the hall and asks me what is this T.E.C. Awards thingie we are nominated for? The TEC awards are 'Technical Excellence & Creativity' awards, sponsored by Mix Magazine's publishers & awarded at the Audio Engineering Society's annual show. This is a big deal. There's like no WAY we're up for anything. Right? So I hop on their website to check it out, and SONOFAB***H .... there it is: My name listed amongst those of the coolest engineers in the world!!! and SugarHill's name amongst the coolest studios!!!! Just to have our work included in this list is unbelieveable. I am truly humbled. Whether we win or not, I am P U M P E D to have been nominated. Recording Studios: Allustrious Studios, NYC; Baseline Studios, NYC; COE.BE.3 Studios, Stone Mountain, GA; The Enterprise, Burbank, CA; The Hit Factory, NYC; The Hit Factory Criteria, Miami, FL; Patchwerk Studios, Atlanta, GA; Right Track Studios, NYC; Silent Sound Studio, NYC; Soho Studios, NYC; Sony Music Studios, NYC, South Beach Studios, Miami, FL, Stankonia Studios, Atlanta, GA; Sugarhill Studios, Houston, TX. Here's the Project Popstar scoop: I was a judge in the contest, which was hosted by Music World/Sanctuary Management (Urban). Music World is the company led by Beyonce's dad, Mathew Knowles. The contest was filmed for television sydication (naturally), and surprised me in that Mathew & the MW/S people took it VERY seriously. I was honored to be a judge, but was pretty casual about the whole process. Mathew, and Destiny's Child, have been super great to me over the years, so I was honored to be asked to be a part of the show. When the final judging came about, Mathew announced that in addition to selecting girls to be in a girl pop group, he was going to select three girls for development as solo acts. He asked me, on camera mind you, if I would produce them, along with his in-house production team, for development. I was flattered, a bit excited, and answered yes quickly. When Mathew announced the winners at the end of the show, he introduced me as a producer and long time associate who would be working with the soloists: Tess Ferguson, Blythe Herring, and Taylor Crowley. Wow! As for the rest of my week, I went to Austin to meet clients & attend the monthly NARAS Board of Governors meeting. Going to Austin to stay overnight is always a treat because Sarah Sharp always welcomes me into her home. We're great friends, so hanging at Casa Sharp is great fun. There were more treats in store. 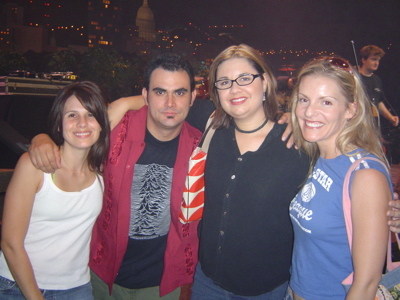 I went up a day early so Sarah and I could go see a taping of Austin City Limits over at the University of Texas where it is produced by Terry Lacona (fellow Board member & ticket hookup, wootwoot!). We saw the band Ozomatli and they were incredible. They started out life as a LA-based latin rock band, but now they are world-beat ambassadors. 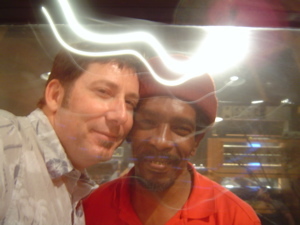 After the taping, we went out with Naras friends & then went to see John Pointer & Carlos Sosa's unreal funk band, Boombox. When we got there, the guys from Ozomatli were onstage with Boombox!!! What a treat! Those guys just tore it up for two sets. Here's the kicker: I got to sit in with the band and members of Ozomatli!!!! I didn't play all that great, (I'm strictly a studio performer these days), but it didn't really matter!!!!! It was SUPER FUN!. Carlos and I are talking about having me mix (some? all?) of their debut record. I'm SUPER pumped about that. More will be revealed! Back to Houston. I met with Kim Hull. Kim is a young singer who is interested in doing a production demo. The cool thing about Kim is that she knows what she's about, and is a talented singer. She was really nervous in our meeting, which was sort of cute, but absolutely the last thing I want to cause in my artists. On to Friday, (pretty long post, huh?... I'm sick at home today, so this is more fun than crappy TV...) Joyce Pierce. Man, I've already gone on about our last session and how great it was. So lets just skip the hyperbole and supurlatives,.... yesterday's session was transcendent. I had to overcome feeling like poopoo, and Joyce and Production Assistant Josh, help keep me focused. Joyce put in a truly inspired performance, and boom, eight hours had passed and we were left with another world-class, vibe. We still have work to do, we need to add some harmonies and backing vocals, but I am really happy. I am reminded that I need to listen to the roughs,.... I wish my ears weren't so stopped up. Ok,.... time to get some rest..
Man, I am SO behind in updating this site. Quick info: I finished mixing Dreadneck and the results were great. I'm going to post the (unmastered) mixes tonight. Go to the sound board & check it out. I was a judge at Music World/Sanctuary's 'Project Popstar' which was yet another reality based 'making the band' type show, but this was really real! I got some work out of the deal -- I'll be producing three new solo acts for development. woo woo! 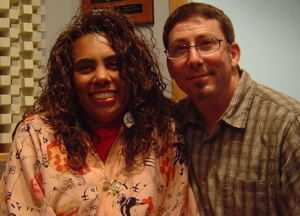 Tonight, I started cutting vocals with Gospel singer extrodinare, Joyce Pierce. Joyce used to be in The Fifth Dimension & she can sing (& testify). I'm digging it. Our collaboration started out really great with both of us doing things that fell outside the plans I started with. The results were awesome. Here's Joyce & I. 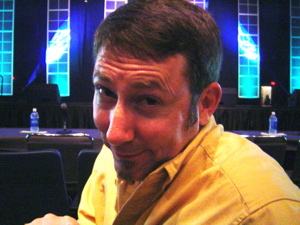 Note my ultra-square hairdo. This is Gary the Shaman-Percussionist! 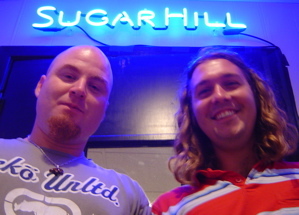 Here's the new SugarHill/Essential Sound/Dan Workman Music staff photo. We got chiggers on us while we posed. Really. OK, I'm not really caught up to date, there is tons more to tell about the Project Popstar deal, but I'm gonna make you wait.